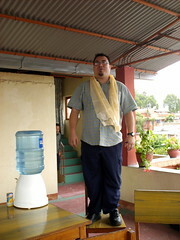 Yesterday was my last day at FTG Nepal, and today is my last day in Kathmandu. A clichéd as it sounds, I don’t know where the time went. I clearly remember a week and a half ago, when I felt like I had so much time left and I was starting to really miss my girls. While I near-ecstatic to be heading home to see my little girl Gwen and my wife Jen, I feel surprised that my time here has already come to an end and I will greatly miss my many new friends and this amazing city and country. 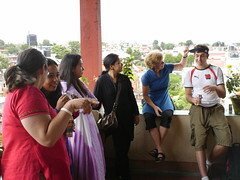 CECI Nepal had a very nice farewell lunch on the terrace on their offices in Baluwatar, Kathmandu for Alex Bertholot and myself (Alex flies home to Quebec on Monday to his parter who is expecting a baby boy in August – félicitation Alex!). Unbeknownst to me, there is a tradition at CECI, that upon such an occasion the celebrants of such a gathering will a) receive a lovely taka scarf and b) stand on a chair deliver a speech and sing! Alex gave a lovely speech and then provided us with a stirring song from My Fair Lady! I did my best to thank they many people who deserved thanks and to share how special this trip has been to me. I then gave my audience the option of a French song or an English song – they opted for an English song. 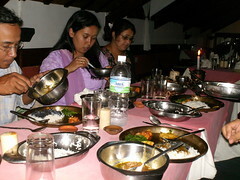 Later that evening FTG Nepal took me out for an unbelievably good dinner. We at at Thamel House which provides authentic Newari food (Newari are the original ethnic group of the Kathmandu Valley) in an authentic Newari setting. We sat on cushions at low tables and had an endless stream of dishes brought to us. This was an absolutely epic meal. In fact, there was a point, where I thought we were finished…and then they brought out a new set of plates for the table! What I thought was the end of the meal, was the end of the appetizers and we were just getting to the main course. I had the chance to drink local raksi, which is Nepali rice spirit. It was firery and sweet and fantastic. It is poured from a metal pitcher from about 5 feet above the table into small terra-cotta saucers. But eclipsing the food and drink was the company. While dinner was three hours, it didn’t feel anything like it. My final time spent with Nina and Sabina and Ashish and Bijay and Sita and Cheong (Radeka was home caring for her son who wasn’t feel well – you were missed Radeka-ji!) 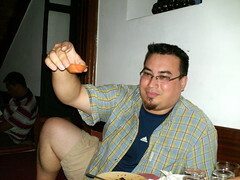 was filled with teasing and laughter and explanations of what we were eating and stories shared by everyone, with everyone. It was the most wonderful way to say goodbye I could imagine. 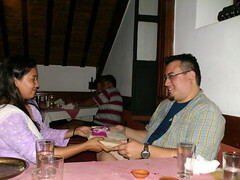 At the end of the meal, much to my surprise, they presented me with a wonderful card and a letter of appreciation that brought me close to tears and a truly beautiful wood carving of very famous window in Bhaktapur known as the Peacock Window. Thank you to everyone at FTG Nepal. Your generosity speaks volumes of how wonderful all of you are. Saying goodbye is always bittersweet – it was wonderful to remember how great this trip was, sad to think that I am leaving my new friends, but also happy to think that soon I’ll be with my family again. Trying to get as much in as I could in my last night in Kathmandu, I met up with the Karen, Erica and Alex at Kilroy’s in Thamel where we had an great time just hanging out and chatting over drinks. If you had asked me if I could find a way to celebrate my departure that would measure up to how great this trip has been, I would have said no – but last night was the perfect ending to my time in Nepal. Everyone here keeps asking me when I am will be returning to Nepal. To be honest I don’t know. But I truly hope that I am able to return, and bring my family to share in this amazing place. Oh Sean, your blogging throughout this whole experience has just been fantastic. I love the anecdotes and the pictures…and if I ever doubted the fact that we were meant to be friends, you singing Barrett’s Privateers has pretty much clinched it. I can’t wait to talk to you when you get back; I have two really big pieces of news to share with you–though you can probably guess at one of them. We’re all excited that you’ll be home soon! I’m glad you’ve had such a good time. I’ll have to make sure I get over to see you, Jen and Gwen very shortly.